These sweet little trusting brown eyes beckoned me to know her. To understand her Spirit and comprehend how she came to travel the vast distance between Tibet and California, passing through other countries and many hands over long years in a dog’s life. What did she encounter along the way. And who. What kindnesses and injustices came her way. Her life has had its turns along the path. Hills and valleys, shadow and light. Rarely does a dog get to choose her ultimate person, her pack, her home territory. But, serendipitously, Raji did. And she chose well! 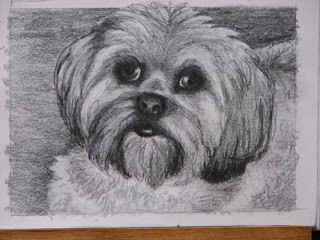 Blessings came to both Raji and her forever person, who opened up her heart , there in the garden of her forever home. Petition to Chinese President Hu Jintao:As citizens around the world, we call on you to show restraint and respect for human rights in your response to the protests in Tibet, and to address the concerns of all Tibetans by opening meaningful dialogue with the Dalai Lama. Only dialogue and reform will bring lasting stability. China's brightest future, and its most positive relationship with the world, lies in harmonious development, dialogue and respect. This is our little Sadie Wonder, lying on Mychal’s grave. We noticed her doing this months ago, when she first came to live with us. The graves of our beloved poodles are fenced in with the blackberry patch, to keep them safe from coyotes. The Apsos love to run up and down in the blackberrys every morning, playing, scouting for bunnies to chase. The graves are sort of out of their way, off in the corner by themselves. Still. 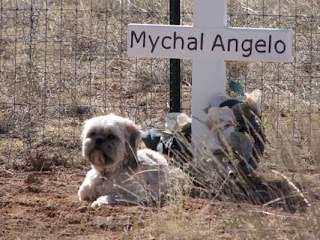 Sadie almost always heads directly over there, circles around the crosses a time or two, then goes directly to Mychal’s grave and lays down for a bit. We don’t know what to make of it, if anything. But it makes us smile to think that her little spirit, in some way, acknowledges his departed spirit over the site of his earthly remains. As Christians, we celebrate the High Holy Day of Easter, or Resurrection Sunday, with an especially joyful heart. By acknowledging that Jesus the Christ, the Son of God defeated sin and death by rising again on the third day after His crucifixtion, our spirits link to His Spirit forever more, and we celebrate not only His resurrection, but our own future resurrection, as well. My joy is complete in knowing that not only will I some day , in my newly glorified flesh, see the Living God, I will also be reunited with those I love, including Mychal. This was the covenant promise that God made to Noah after the flood. It is a promise made not just to Noah, but to all mankind, all creatures, and the earth herself. I hold on to it during these present days of violent weather and global warming. I remind myself of God’s continuing care for the earth and all her creatures when I read of the horrible cruelties that sinful man inflicts on the other living beings that share this planet with him. I cling to it when the politicians and greedy businesses plunder and spoil the land and water and air for their own gain, without a thought to the future. This day, in particular, is enough to sustain that hope and convince me that it is not misplaced. Today is the first day of Spring! The equinox occurred sometime last night. I awoke this morning to a new season on this old earth! Once again, without fail, spring has come! 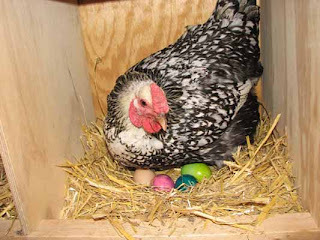 And here, one of our hens, full of the gift of life itself, ponders the miracle of the egg! What surprise! What joy! In amazement and awe I give thanks for this new season of hope and renewal! Two Irish sisters met one another over the Internet. 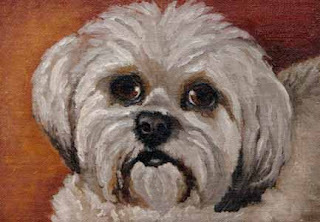 Common interests that drew them together were love of Lhasa Apsos, a fondness for fabric and fiber, devotion to silent meditation, common faith and a delightful discovery that both shared Celtic heritage and surnames. 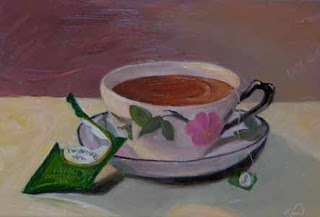 The tea came in a St. Patrick’s Day package of mirth and joy from the Cavanaugh half, and the Daugherty lass drank it up in toast to them both! Here’s to you, Kathy Cavanaugh, Irish sister in blood and faith! Easter falls on the first Sunday after the first full moon after the Spring Equinox. It’s easier to figure if you use a lunar calendar, which is what the ancient Hebrews used, rather than the Roman calendar that we use today. This year, Easter will be earlier than any of those presently living will ever see, for the rest of our lives. The last time it was this early was in 1913, and the next time it will be this early will be in 2228. Easter is the High Holy Day of the Christian Church worldwide, and is the New Testatment fulfillment of the Old Testatment event known as Passover. Christians consider that Christ became the Passover Lamb, and so we acknowledge His death on the cross as the Sacrificial Lamb for the sins of all mankind. We celebrate his resurrection on Easter Sunday morning as the fulfillment of the promise of Passover. 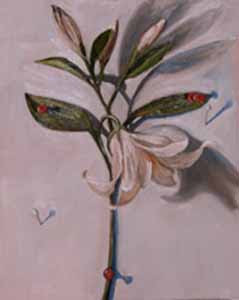 The lily, as one of the first flowers of spring, has become an enduring symbol of the resurrection. The season of Lent precedes Easter by 40 days. Christians use this time to reflect on the great sacrifice our Lord made for us, as he prepared to offer himself up as payment for the sins of mankind. I offer this Lily on this, the 31st day of Lent, for your contemplation, and mine. Have you ever wondered what a “Bird’s Eye View” really looks like? From way up high, how well do they really see? Bird biologists tell us that eagles, hawks and other raptors have built-in telephoto lenses in their eyes. Sort of like looking through binoculars all the time. Ravens have remarkable eyesight, too. I wouldn’t doubt that they, too, have a built-in zoom lense. They can spot a tasty tidbit or remains on the road from a long distance. I’ve painted this pair many times. I don’t know where they nest, but our acreage is within their territory and they hang out around our place a lot. Yesterday, they were harassing a pair of red tail hawks, who also call this area their home. Ravens are daring and raucous, and the red tails screamed and dove at them, but eventually gave it up and flew on their way. Occasionally, we are forced to dispatch a gopher who tunnels his way into our blackberry patch. We put the dead gopher up on a corner post, sort of a “gopher on a stick” and wait for the ravens to spot it. No sense in wasting good food. The first time, they couldn’t figure out what a juicy morsel like that was doing up on a post. But now, it’s de rigueur, and they sit nearby on the fence, just in case, patiently waiting for the hoped-for gopher du jour every time we work outside.